This article is authored by Jordan L. Mullins with the mentorship of Sarah M. Tashjian and is a part of the 2018 pre-graduate spotlight week. According to the American Psychological Association, parenting practices around the world share three major goals: ensuring children’s health and safety, preparing children for life as productive adults, and transmitting cultural values (APA, 2018). Needless to say, these objectives are ambitious. Being a successful parent is no small feat and whether children become competent, healthy, productive adults depends on a variety of environmental and biological factors. The influences on child outcomes are numerous, but a wealth of literature indicates parenting practices are an important part of the equation. The extent to which parenting practices shape behavioral development in children is a complex question and, though we may not be able to answer it with certainty, we can be certain that parents are important factors in their children’s behavioral outcomes. Research has found consistent links between parenting and child behavioral adjustment. For instance, a mother’s parenting behaviors, including the extent to which she displays affection toward and exerts behavioral and psychological control over her child, when that child is five years of age are linked to later child internalizing and externalizing behaviors (Aunola & Nurmi, 2005). Internalizing, or emotional, behavior problems often refer to anxiety and depression (Akhter et al., 2011). Externalizing, or disruptive, behavior problems commonly include attention-deficit hyperactivity disorder and conduct problems (Akhter et al., 2011). These are just a few common behavioral problems that are, in part, shaped by particular styles of parenting. The attempt to study the influence of parenting practices on child outcomes is complex because there exists an overwhelmingly wide range of parenting behaviors and an equally wide range of child behavioral outcomes. The causal relation between parenting practices and child behavior outcomes is similarly opaque depending on the timing and measurement of the behaviors in question. For example, in a study of adolescents’ perception of their parents’ psychological control, or the extent to which parents try to control their children’s emotions and beliefs, and adolescents’ self-reported internalizing and aggressive behaviors, researchers found child behavior as a stronger predictor of changes in parental psychological control than parental behavior as a predictor of changes in adolescent behavior (Albrecht et al., 2007). Because this relation is multidirectional, studying the influence of parenting practices over child behavioral outcomes becomes even more complex. 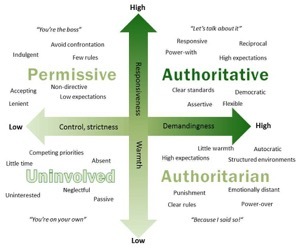 A common way of addressing these complexities is to organize parenting behaviors into four distinct parenting styles: authoritarian, permissive, uninvolved, and authoritative (Maccoby & Martin, 1983). These four parenting styles are based on two parental dimensions: parental warmth, which is related to parental affection toward and acceptance of the child, and parental control, which is related to the active role parents play in promoting respect for rules and social conventions (Maccoby and Martin, 1983). There has been extensive research on the implications parenting styles have on behavioral outcomes in children. The authoritarian parent combines low levels of warmth with high levels of control and employs a strict discipline style characterized by minimal negotiation with the child, high expectations, limited flexibility, frequent use of punishment, and one-way communication from parent to child (Baumrind, 1991). Authoritarian parenting has been associated with child outcomes such as hostility, delinquency, rebelliousness, and antisocial aggression (Baumrind, 1991). Research has also found that a child’s early experience with excessive parental control tends to correlate with the development of anxiety (Chorpita & Barlow, 1998). It is possible this anxiety stems from a lack of opportunity to develop autonomy through independent exploration of the environment (Bowlby, 1977). It has also been proposed that the low warmth typical of authoritarian parenting could be linked to child depression (Rapee, 1997). The permissive parent exhibits high levels of warmth and low levels of control. He or she acts more like a friend than a parent, employing a lax discipline style with few rules, little to no expectations, and minimal guidance or direction (Baumrind, 1991). Parents with this style have a tendency to be very loving and nurturing, but also allow their children to solve problems without parental involvement (Baumrind, 1991). In a study of permissive parenting, lack of involvement, lack of follow through, and lack of confidence in parenting ability were important predictors of child behavior problems reported by both parents and teachers (Calzada, 2001). Because permissive parents tend to be non-demanding, it becomes much more difficult to control children’s behaviors and outline boundaries in children’s environments (Baumrind & Black, 1967). Research has found links between the excessive parental indulgence often found in permissive parenting practices and children’s decreased social competence and academic achievement (Chen et al., 2000). Permissive parenting has been linked to bossy, dependent, impulsive behavior in children, with low levels of self-control and achievement and a failure to learn persistence and emotional control (Baumrind, 1967). The uninvolved parent combines low levels of warmth and low levels of control, and does not utilize any particular discipline style (Baumrind, 1991). He or she often displays little interest in being a parent. Communication is limited, nurturance is low, and the child, generally, has an excessive amount of freedom (Baumrind, 1991). Because the uninvolved parent is neither demanding, nor responsive, and because young children are highly dependent on parental structure and support, uninvolved parenting has been associated with behavioral problems and depression in children (Downey & Coyne, 1990). Additionally, adolescents who are exposed to uninvolved parenting practices often perceive high levels of rejection and tend to exhibit more externalizing behaviors, aggressive behaviors, delinquent behaviors, hostility, and attention problems (Ruchkin et al., 1998; Meesters et al., 1995; & Barnow et al., 2002). It is also possible that the effects of uninvolved parenting persist through adolescence and into adulthood (Nijhof & Engles, 2007). In a study of first year college students, researchers found that individuals who reported being raised by uninvolved parents showed more internalizing and externalizing problems in reaction to negative emotions such as homesickness (Nijhof & Engles, 2007). Additionally, these students, generally, coped with problems less effectively than individuals who reported growing up in a loving and accepting home environment (Nijhof & Engles, 2007). The authoritative parent displays both high levels of warmth and high levels of control (Baumrind, 1991). Parents in this category are reasonable and nurturing, set high expectations, explain disciplinary rules clearly, and engage in frequent communication with their children (Baumrind, 1991). Authoritative parenting has been associated with greater child competence, exceptional maturity, assertiveness, and self-control (Baumrind, 1991). Authoritarian parents who employ child-centered disciplinary practices, and who use verbal reasoning and explanations, tend to raise children who display high levels of moral reasoning, markers of moral conscience, and prosocial behaviors (Krevans & Gibbs, 1996). Research has shown that authoritative parenting may be the most effective style, however, it also tends to be the most demanding in terms of parental energy and time (Greenberger & Goldberg, 1989). It is possible that parents who are living under conditions of stress, such as poverty, may be less likely to display authoritative parenting behaviors, and more likely to employ less effective parenting practices. Research suggests parents of a higher socioeconomic status household, are more likely to employ democratic (Hoffman, 1963) and child-centered (Sears et al., 1957) parenting practices, in contrast to the authoritarian and parent-centered style that characterizes lower socioeconomic status homes. This would lead to an increased likelihood of raising children who display internalizing and externalizing behavior problems, which, in turn, is likely to put the family under more stress. This circular trend has major implications for the future, as it contributes to systemic inequity for families in poverty (Kohen, 1998). More extensive research is critical to enhancing the field’s current understanding of parenting styles and the role they play in child behavioral outcomes. An increased understanding of the roots of different parenting practices, may enable the field to more effectively address the environmental factors that lead parents to adopt less ideal strategies. This research should be used to guide the development of more effective prevention and intervention programs aimed at fostering adaptive behavioral development in children. Because parenting programs have been found to demonstrate a large and sustained effect on early disruptive behavior problems (Comer et al., 2013), it is important to ensure these programs are widely available to at-risk families, and that these families are aware of their availability. Additionally, parenting programs are typically delivered in a group format versus individualized therapy, which has been found to be cost-effective, decrease stigma, and promote peer support (Comer et al., 2013; Gross et al., 2003; Sanders, 1999). It is imperative parents are not blamed for their parenting practices or for their children’s behavioral outcomes, but are instead given the opportunities and resources they need. Taking advantage of these resources may help parents employ more appropriate parenting practices and promote the adaptive behavioral development of their children. Jordan L. Mullins graduated from the University of California, Davis, in 2017 with a B.A. in Psychology and a double minor in Spanish and Human Development. She is currently a research assistant in Dr. Galvan's Developmental Neuroscience Laboratory. Jordan is particularly interested in clinical psychology, parent-child relations, and family dynamics, and hopes to conduct research on these topics once in graduate school. Akhter, N., Hanif, R., Tariq, N., & Atta, M. (2011). Parenting Styles as Predictors of Externalizing and Internalizing Behavior Problems among Children. Pakistan Journal of Psychological Research, 26(1), 23-41. Albrecht, A., Galambos, N., & Jansson, S. (2007). Adolescents' internalizing and aggressive behaviors and perceptions of parents' psychological control: A panel study examining direction of effects. Journal of Youth and Adolescence, 36(5), 673-684. Aunola, K., & Nurmi, J. (2005). The role of parenting styles in children’s problem behavior. Child Development, 76(6), 1144–1159. Barnow, S., Schuckit, M., Smith, T. L., Preuss, U., & Danko, G. (2002). The real relationship between the family density of alcoholism and externalizing symptoms among 146 children. Alcohol and Alcoholism, 37(4), 383–387. Baumrind, D. (1967). Child care practices anteceding three patterns of preschool behavior. Genetic Psychology Monographs, 75(1), 43-83. Baumrind, D. & Black, A. E. (1967). Socialization practices associated with dimensions of competence in preschool boys and girls. Child Development, 38(2), 291-327. Calzada, E. J. (2001). Normative and optimal parenting in Dominican and Puerto Rican mothers of young children (Order No. AAI9984400). Available from PsycINFO. (619708281; 2001-95004-303). Chen, X., Liu, M., & Li, D. (2000). Parental warmth, control, and indulgence and their relations to adjustment in Chinese children: A longitudinal study. Journal of Family Psychology, 14(3), 401-419. Comer, J., Furr, J., Cooper-Vince, C., Madigan, R., Chow, C., Chan, P., Idrobo, F., Chase, R., McNeil, C., Eyberg, S. (2015). Rationale and considerations for the internet-based delivery of parent–child interaction therapy. Cognitive and Behavioral Practice, 22(3), 302-316. Downey, G. & Coyne, J. (1990). Children of depressed parents: An integrative review. Psychological Bulletin, 108(1), 50-76. Greenberger, E. & Goldberg, W. (1989). Work, parenting, and the socialization of children. Developmental Psychology, 25(1), 22-35. Gross, D., Fogg, L., Webster-Stratton, C., Garvey, C., Julion, W., & Grady, J. (2003). Parent training of toddlers in day care in low- income urban communities. Journal of Consulting and Clinical Psychology, 71, 261–278. Hoffman, M. L. (1963). Personality, family structure, and social class as antecedents of parental power assertion. Child Development, 34, 869–884. Kohen, D. E. (1998). Parenting behaviors: Associated characteristics and child outcomes (Order No. AAM9809732). Available from PsycINFO. (619378018; 1998-95006-332). Krevans, J., & Gibbs, J. C. (1996). Parents use of inductive discipline: Relations to children’s empathy and prosocial behavior. Child Development, 67(6), 3263-3277. Maccoby, E. & Martin, J. (1983). Socialization in the context of the family: Parent-child interaction. Handbook of Child Psychology Vol. 4. 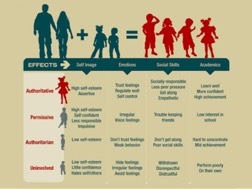 Socialization, Personality, and Social Development, 4, 1-101. Meesters, C., Muris, P., & Esselink, T. (1995). Hostility and perceived parental rearing behavior. Personality and Individual Differences, 18(4), 567–570. Nijhof, K., & Engels, R. (2007). Parenting styles, coping strategies, and the expression of homesickness. Journal of Adolescence, 30(5), 709-720. Rapee, R. (1997). Potential role of childrearing practices in the development of anxiety and depression. Clinical Psychology Review, 17(1), 47-67. Ruchkin, V., Eisemann, M., & Hägglöf, B. (1998). Parental rearing and problem behaviors in male delinquents versus controls in northern Russia. Social Psychiatry Epidemiology, 33(10), 477–482. Sanders, M. (1999). Triple P-positive parenting program: Towards an empirically validated multilevel parenting and family support strategy for the prevention of behavior and emotional problems in children. Clinical Child and Family Psychology Review, 2(2), 71–90. Sears, R. R., Maccoby, E., and Levin, H. (1957). Patterns of child rearing. Evanston, IL: Row, Peterson.